In writing the following article for GV, I raked the internet looking for negative feedback on Digicel's recent launch in Haiti and ... could find hardly any. The only people who are visibly upset are competitors Haitel and Comcel-Voila (who had to decrease their prices) and local regulatory body CONATEL who has tended to side with the latter. There has got to be another side to this story (no one wants to give a non-locally owned giant corporation a free pass), but I haven't come across it yet. I'll let you know when I (and if) do. 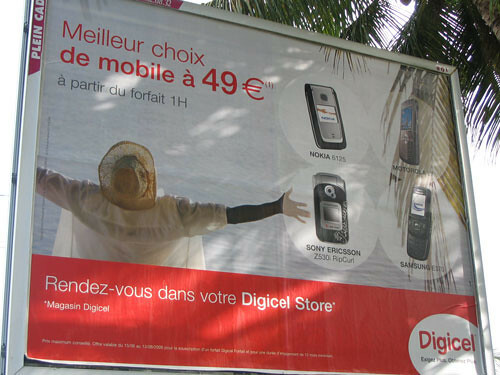 Digicel billboard, Martinique. By blogger Greg at InternetRapide.com. Jamaica-based Caribbean telecom giant Digicel has a presence in over a dozen countries in the region. Digicel officially launched operations on the Haitian market in May to much resistance from local private telecoms Haitel and Comcel but bloggers and other web commentators seem to agree that Digicel’s presence on the Haitian market is actually a good thing for local consumers’ pockets, for their safety as well as potential job creation. Digicel offers have been commercialized since May 3, 2006. Digicel obtained a license to operate a GSM network on the island since June 2005. The operators already in place in Haiti operate on CDMA and TDMA networks (…) The launch in Haiti is an important step in the development of Irish magnate Denis O'Brien's company and represents 130 million dollars in investment. Digicel you are the best. If you want to cover Haiti, just go to all corners that others do not reach. Put antennas in small towns where others do not go; you will see results. All will come to you. When will you activate service? Many are awaiting activation. Thank you. I love you.